The thin, sharply pointed bill and greenish plumage of this bird look good for a wood warbler of some kind. The underparts aren't bright yellow as would be found on a Wilsonia. The Oporornis are also yellow below and have dark hoods (Mourning, Connecticut, MacGillivray's) or a dark face patch (Kentucky). Female and immature American Redstarts are whitish below with yellow or orange patches on the sides and (usually) on the wings. Black-and-white Warbler is, well, black and white, not greenish. The lack of streaking on the underparts is all wrong for Ovenbird and the waterthrushes. Swainson's Warbler has a longer, heavier bill and is dull olive above. A Common Yellowthroat would have yellow undertail coverts and a yellow throat that contrasts with a darker face. Almost all of the Dendroica warblers have streaking on the upperparts or the underparts, while the upperparts and underparts of our quiz bird look unmarked. Immature Yellow Warblers can be plain and nondescript but lack the pale supercillium and dark eyeline of our quiz bird. Pine Warbler, another nondescript Dendroica, would have a contrasting dark cheek patch and a heavier bill. Even the dullest Cape May Warbler would have some streaking on the underparts. Female Black-throated Blue Warbler would have a narrow white supercillium, a white arc under the eyes, and (usually) white at the base of the primaries. A female Cerulean Warbler would have two prominent white wing bars. That leaves the genus Vermivora to consider. Blue-winged and Golden Winged Warblers have different underpart colors and head patterns, but one of the Vermivora warblers that lacks wing bars might do the trick. Nashville and Virginia's Warblers have white eye rings and gray heads. The green on the back of our quiz bird is too bright for an Orange-crowned Warbler and it seems to lack the yellowish undertail coverts of that species. That leaves Tennessee Warbler which is what this bird is. 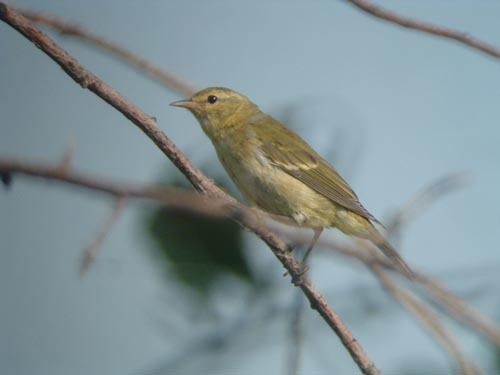 This Tennessee Warbler was photographed at Montrose Point in Chicago on September 6, 2005. But what about the prominent wing bar? This could be an abberant individual with an unusually strong wing bar or it could be a juvenile. All of the Vermivora warblers that lack wing bars as adults have wing bars as juveniles. Juvenile warblers normally molt out of juvenal plumage on the breeding grounds so we usually don't see them during migration.